You knew that as 2016 closed out we would be met with another "hottest year ever" claim. That, of course, prompted another round of alarmists warning that we're running out of time to save Planet Earth. And, once again, the real facts tell a different story. The average temperature in 2016 was only .01 degrees Celsius warmer than it was in 2015. That is well within the .1 degree margin of error. While 2015 was .17 degrees Celsius above 2014, a warmer 2015 and 2016 was undoubtedly due to the fact that they were both El Niño years. When you go back to the end of 2014, another year claimed to be "the warmest ever," you'll find the difference was only .02 Celsius from the year before, which is well within the .1% margin of error. Of course, you can't just stick a thermometer in the Earth and take its temperature. Adjustments are constantly being made to how these temperature records are calculated. It's been argued that the "adjustments" have been politically inspired to make today's temperatures look warmer while those decades earlier to look much cooler than they were. I wouldn't rule that out. Unfortunately we've allowed science to become so politicized, including with respect to global warming.. Any scientist who dares to question the orthodoxy, i.e. 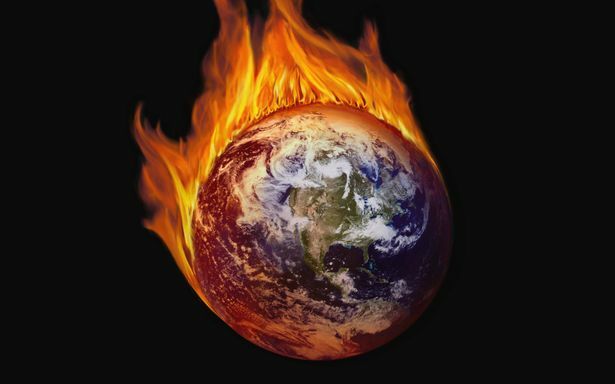 that dangerous man-made global warming is dooming the planet, is ridiculed professionally and doesn't receive government grants for studies that might dare challenge this orthodoxy. This week, EPA nominee Oklahoma Senator Scott Pruitt, a long-time critic of former President Obama's climate change policy, testified that he believed climate change was real and that man has been a contributor to that change. Some environmentalists were shocked. They shouldn't be. The climate on good old Planet Earth has been changing for 4.5 billion years so we shouldn't assume that it suddenly stopped changing under our watch. As far as man having an effect on climate, you only have to see the difference in temperature between warmer cities and the cooler rural areas surrounding those cities to know that the activity of man affects temperature readings. The debate should have always been about how much of an effect and the negatives and positives that come with living in a warmer climate. Increased CO2 levels, for example, have been tied to larger crop yields and greater drough resistance of those crops. Warmer temperatures also means a longer growing season in certain places. The bottom line is the scientists have no way of measuring the impact man-made activity has on the climate, no way of separating it out from what could very well be a natural increase in temperatures due to endless climate change. It has always been a guess, nothing more than that. Alarmists have also too long gotten away with the starting assumption that today's climate is the ideal and that a warmer climate, and higher CO2 levels, is a bad thing. That assumption should be questioned. Man has historically done better when the climate has been warmer, including warmer than today. Now that there is new leadership in Washington, I hope we can can finally have a truly honest debate about global warming, its ties to man, the positives and negatives associated with living in a warmer climate, and a cost-benefit examination of any proposed steps to combat global warming. Maybe something good can come out of the Trump administration, after all. A smaller, less globally spread US military should make conservatives happy because of reduced government spending and conservationists happy because it is a huuuuge (intended) user of fossil fuels. Paul, you say, "It has always been a guess, nothing more than that." That kind of statement ignores the very scientific information you say is missing or politicized. I think you have a strong point that the research could have been influenced by politics if the scientists changed the methodology on how to measure temperature, but you would have to show me when and how the change was made, and what the real result would be if an adjustment were made to translate the new measurements to the old scale. The information I have seen does not look like guesswork: satellite imagery of the polar icecap changes over time, aerial views of clear-cut rain forest, aerial views of mountaintop removal, real and life-affecting changes in sea level rise. These facts are inputs to scientific analysis, and are demonstrable and can be replicated. It is one thing to ask scientists to be true to scientific method. It is another, and worse, thing to dismiss everything in the picture. As I have asked before, just as Arnold Schwarzenegger has asked, if we remedy the insults to our environment by shifting to renewal energy, would we be unhappy with the benefits that result if we later learn that man was not as much a cause of dangerous climate change? Paul, you are absolutely correct on this issue. "Global warming"- sometimes referred to as "weather change"- is based on false science, proved distortion of data, and outright lies. The underpinnings of this false theory is to restrict the individual's right to use energy in any way not approved by a central authority. It is another way to make the individual dependent on the State and to be completely regulated by the State-- which is, when you get right down to it, the new slavery. Liberalism is a mental disorder and nothing advances this concept more demonstrably than the extremist religion of global warming whose apostles of disintormation most often consist of liberal political types who believe they can pass laws to change the behavior of the Sun- where coronal blasts and plasma ejections may more effect Earth change and weather than any mere human could. Paul, real thinkers, critical thinkers, lovers of science and lovers of the truth who have debunked this charlatan science will be villified and shouted down... as you have been in the past and again with the current column on the subject. That leftist Democrats are doing all they can to make disbelief in the junk science of global warming a crime for which one can be fired or legally punished is testimony to the crackpot "masterminds" who believe looking at a polar ice cap within the super-small scale of a human lifetime or two actually means something. PS And because non-liberal left types like me must provide credentials, I am Purdue School of Science matriculated with Honors. It does amaze me, Paul, that you're so obstinate on this topic. Some ninety-seven percent of published scientific studies conclude that human activity is the biggest driver of climate change. How much more consensus do you need? Paul and alternative facts. Are you trying to be one of those guys that will say anything for a pay check. Stop calling yourself a Christian. You're a liar, you're a shill. "Some ninety-seven percent of published scientific studies conclude that human activity is the biggest driver of climate change." Yet alarmists continue to use it, even ones who know it is a gross mischaracterization. Makes you think they're not interested in a factual debate. "Multiple studies published in peer-reviewed scientific journals show that 97 percent or more of actively publishing climate scientists agree: Climate-warming trends over the past century are extremely likely due to human activities. In addition, most of the leading scientific organizations worldwide have issued public statements endorsing this position." Somehow I don't think NASA (or the other scientific organizations listed) are "alarmists", and who better to ask about climate change than climate scientists? Paul probably believes the one or two "scientists" paid to say smoking isn't dangerous. Paul is a second rate lawyer and NOT a scientist. He is however a propagandist. The reaction I have, Paul, from all these believers in the lie of fake 'global warming' is laughter. When it comes to real Science, "consensus" does not equal fact. My takeaway from the commentary here is that one doesn't have to be an utter moron to believe in the lie of global warming... but it helps.